The sanctuaries in SoCal coastal waters were created to curb steep declines in fish and other sea creatures. Two years after the creation of marine sanctuaries in more than 350 square miles of Southern California coastal waters, state wildlife officials and environmental groups say the restrictions on fishing are largely being obeyed. 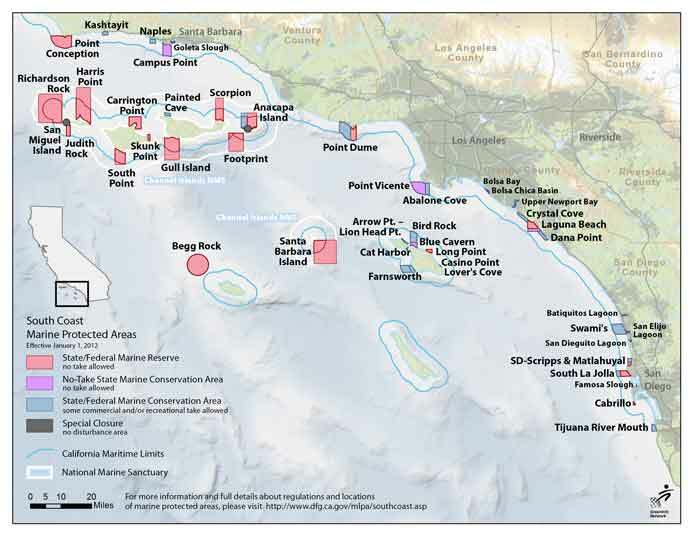 The reserves, known as Marine Protected Areas, bar or limit fishing in 50 zones spanning 15% of state waters from Santa Barbara County to the Mexican border. They took effect in the state’s busiest region in 2012, with some favored fishing spots remaining open and others placed almost entirely off-limits to promote marine life conservation. Recreational fishermen who fought their lost access have suffered a series of defeats in court. After spending more than $1.3 million on legal challenges, the United Anglers of Southern California say they are running out of money and are close to giving up. “We’re still fighting, but we’re probably going to end up losing,” said John Riordan, the group’s treasurer. Under the 1999 Marine Life Protection Act, California created a statewide network of marine sanctuaries in an attempt to curb steep declines in fish and other sea creatures. Wildlife officials relied on scientific advisors and fierce negotiations between fishing and conservation groups to design the chain of coastal sanctuaries in four segments, with the last along the state’s rugged North Coast taking effect at the end of 2012. Compliance, so far, has been high. Wardens last year issued about 145 citations for violations of Southern California’s marine protected areas — a fraction of the roughly 4,000 tickets issued for various violations across the eight-county district encompassing the sanctuaries, said Dan Sforza, an assistant chief of enforcement for the state Department of Fish and Wildlife. As an avid sport fisherman I wish the United Anglers of Southern California would support the MPAs, not fight against them! I found it ironic this summer when Mexico halted Pacific BFT fishing to conserve, but CA continued to allow it. CA finally reduced the sport catch limit of pacific BFT like last month. Commercial fishing does the most harm, but sport fishing has an impact too. I think we all love the fish and wish there were more of them, but unfortunately there is also an element of greed and selfishness. I guess it is the age old “tragedy of the commons”.